In the beginning of the 1990s, the balance surplus of nitrogen was more than 80 kg N/ha, after 2000 it started diminishing, and in the last years it varies between 20 and 50 kg N/ha a year. 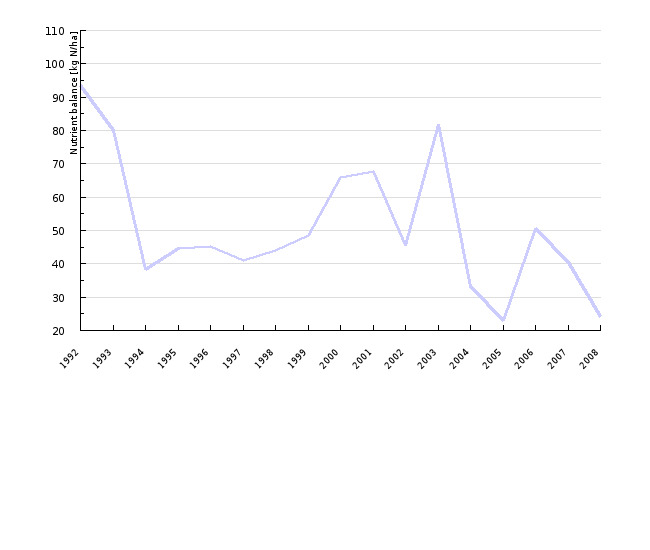 The indicator presents the nitrogen balance in Slovenia for the period 1992-2008. The data on input and output of nitrogen from agricultural land, and the structure of input and output of nitrogen according to each source are presented, and a comparison with the EU-15 countries for 2000 is given. The balance of nitrogen (N) in agriculture, according to OECD (2007) methodology, is defined as the difference between input and output of nitrogen from agricultural land. Sources of input of nitrogen in agricultural land represent mineral fertilizers, livestock manure, and other kinds of organic manures, biological nitrogen fixation, atmospheric deposition and nitrogen from the seeds and planting material. 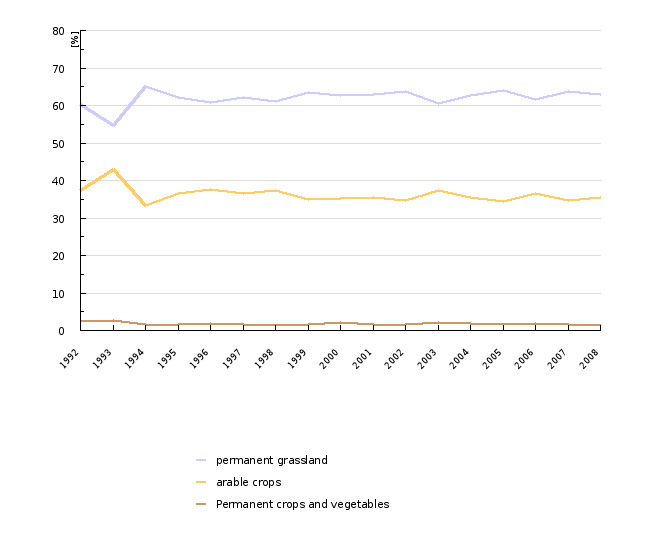 Output of nitrogen from agricultural land present harvested agricultural crops. Agricultural Institute of Slovenia, 2010. Agricultural Institute of Slovenia, 2010; OECD, 2010. - balanced consumption of nitrogen from mineral fertilizers and livestock manures, gradual increase in the scope of ecological production, and prevention of soil loading from point sources and non-point sources. - reduction and prevention of further pollution of waters by nitrates from agricultural production. The balance of nitrogen (N) in agriculture is the difference between the input and the output of nitrogen from agricultural land. Surplus of nitrogen input over output present an environmental threat, because they accumulate on the ground, leach to waters, or end up in the air in gaseous state. In the period 1992-2008, overall input of nitrogen on agricultural land reduced from 84,266 tons of N to 69,822 tons of N or by 17.1 %. Additionally, the input of nitrogen per hectare of utilised agricultural area has reduced, namely from 152 kg N/ha to 142 kg N/ha or for 6.5 %. The main source of nitrogen input on agricultural land is the nitrogen from mineral fertilizers and livestock manures, which on average contributed 84 % to overall input of nitrogen in the mentioned period (or 42 % for mineral fertilizers as well as for livestock manures). Contributions from other sources of input of nitrogen on agricultural land are lower: atmospheric deposition of nitrogen contributes 10 % to overall input of nitrogen, biological fixation by nitrogen with legume crops 5 %, and input of nitrogen through seeds and planting material 0.4 %. The main reason for reduced input of nitrogen in the period 1992-2008 is primarily the 35.7 % reduction of nitrogen input from mineral fertilizers. 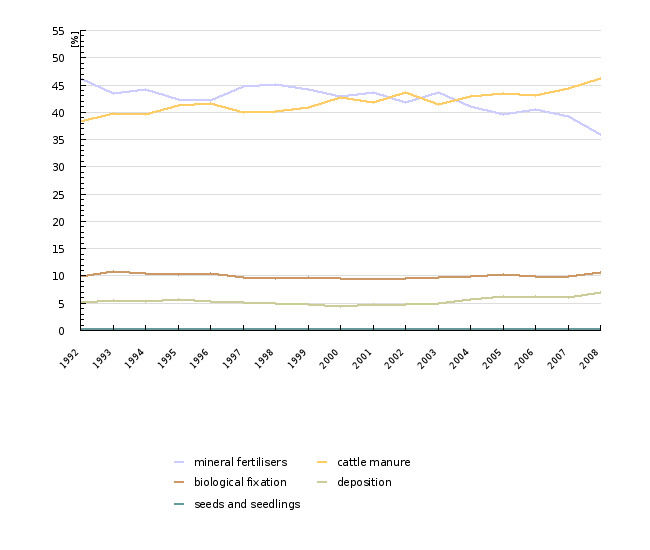 The input of nitrogen from livestock manures has mainly remained unchanged. Due to the reduction utilised agricultural area, also the input of atmospheric nitrogen has reduced (for 11.4 %) and the input of nitrogen through seeds and planting material (for 8.7 %). In the period 1992-2008, due to greater crops and areas of legume crops, only the input of nitrogen by biological fixation increased, namely for 11.6 %. Output of nitrogen with crops varied considerably in the period 1992-2008, since it amounted between 32,000 and 62,000 tons of N. Output of nitrogen per hectare of utilised agricultural area in the mentioned period amounted between 58 and 122 kg N/ha a year. Such great differences are conditional upon different weather conditions, since mainly in the periods of draught due to lower crop yields, the output of nitrogen also decreases. The main source of nitrogen output in the period 1992-2008 was permanent grassland (around 63 %), arable crops and sown grassland contributed around 35 %, while the contribution of permanent plantations (orchards, vineyards, and olive plantations), and vegetable crops was relatively small (around 2 %). The balance of nitrogen, thus the difference between the input and the output of nitrogen, indicates a balance surplus of nitrogen. In the period 1992-2008, it amounted between 23 and 94 kg N/ha. We observed the greatest balance surplus (more than 80 kg N/ha) in the years 1992, 1993 and 2003. Until 2000, with the exception of years 1992 and 1993, the balance surplus was 38-66 kg N/ha, and after 2004, it is mainly decreasing, so that in 2008, it was only 24 kg N/ha. In 2000, Slovenia had a slightly higher balance surplus (66 kg N/ha) than EU-15 average (55 kg N/ha). Among the countries with distinctly higher balance surplus are the Netherlands (226 kg N/ha), Belgium (174 kg N/ha), Luxembourg (117 kg N/ha), and Germany (105 kg N/ha). The lowest balance surplus in 2000, was in France (25 kg N/ha), Italy (37 kg N/ha), and Sweden (38 kg N/ha). Objectives summarized by: Resolution on National Environmental Action Plan 2005-2012 (ReNEAP, OG RS, No. 2/06), Rules concerning good agricultural practice in manuring (OGRS, No. 130/04) and Decree concerning the protection of waters against pollution caused by nitrates from agricultural sources (OG RS, No. 113/09). Methodology and frequency of data collection for the indicator: Data on the balance of nitrogen are calculated on the basis of the data of the Statistical Office of the Republic of Slovenia on the consumption of mineral fertilizers, on the area of utilised agricultural area, on crops and areas of each species of agricultural plants, on the number of domestic animals and dairy farming (STAT-SI) and on the basis of expert evaluations and literature values for nitrogen content in crops, quantity of nitrogen in livestock manures for each species of domestic animals etc. Detailed information on the methodology is available at the authors of the calculation at the Agricultural Institute of Slovenia. The balance of nitrogen for Slovenia is calculated on an annual basis for the period 1992-2008. Data processing methodology: Data on the input and the output of nitrogen are indicated in tons of nitrogen (t N) and in kilograms of nitrogen per hectare of utilised agricultural area (kg N/ha) a year. The data on the balance of nitrogen is calculated as the difference between the input and the output of nitrogen and is expressed in kg N/ha. - Indicator advantages and disadvantages: The data on the balance of nitrogen is calculated on the basis of official records and expert evaluations. Data on the balance of nitrogen are weighed with certain uncertainty, originating in the uncertainty of official evaluations and unreliability of expert evaluations. In the case of expert evaluations, we relied on findings of some researches and expert works, or on the evaluations for comparable OECD members. The OECD does not prescribe unified coefficients for the calculation of the balance of N, therefore it is being left to the countries to rely on their own expert evaluations. Due to the aforementioned, the data on the balance of nitrogen in Slovenia are to a certain extent unreliable however, we estimate that they reflect the actual state relatively well. Reliability of the indicator (archival data): Since the data on the balance of nitrogen are calculated for a longer period (1992-2008), we do not exclude the possibility that the comparability of the data between years can be questionable to a certain extent, because in the mentioned period the data acquisition methodologies for official records were changing. We are observing this mainly in data on crops and areas of each species of agricultural plants. 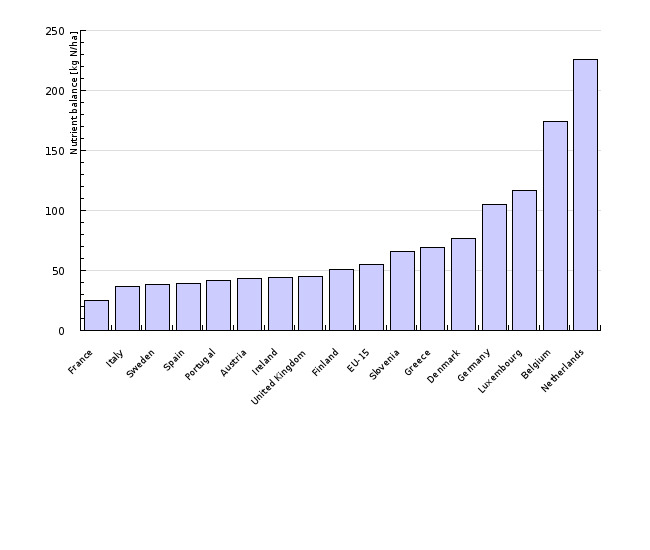 Source database or source: Data on the balance of nitrogen for old Member States of the European Union (EU-15) for 2000 are summarized from the website OECD and are available in the framework of the indicator IRENA 18.1 – Gross nitrogen balance (IRENA Indicator Fact Sheet) on the European Environmental Agency website. Methodology and frequency of data collection for the indicator: Data on the balance of nitrogen for old Member States of the EU (EU-15) for 1990 and 2000 are stated on the OECD website. For the indicator we used the data for 2000. Data processing methodology: The data on the balance of nitrogen for each country of the EU-15 are indicated in kilograms of nitrogen per hectare of utilised agricultural area (kg N/ha). Geographical coverage: EU-15 consists of old Member States of the EU: Austria, Belgium, Denmark, Finland, France, Greece, Ireland, Italy, Luxembourg, Germany, The Netherlands, Portugal, Spain, Sweden, and the United Kingdom. - Indicator advantages and disadvantages: Since new data for EU Member States are not available, we cannot speak about the Indicator advantages and disadvantages. Author(s): Janez Sušin, Jože Verbič, Agricultural Institute of Slovenia.